Contrary to estimates of a bumper crop, the arrival of cotton is very tardy in Sirsa, the biggest producer of cotton in Haryana. Sirsa accounts for over 35 per cent of the total cotton crop of Haryana and this year, a 2.10-lakh hectare area of the district is under cultivation of cotton out of the 5.98 lakh hectares in Haryana under the crop. Ratia, the Assembly seat fallen vacant due to the death of the INLD’s Gian Chand Odh on September 12, will go for the first byelection in its history. The Haryana Government has decided to give another opportunity for regularisation of existing industrial units within the controlled areas in the state and for this, they will have to apply to the concerned District Town Planner (DTP) by December 30, 2011. The police has recovered a 22-year-old girl hailing from Madhya Pradesh from the local railway station. The drive to check the use of nicotine through hookah smoking continues. At least five such places were raided in the town today by officials of the Food and Drug Control Department. Two samples of nicotine were collected. The arrival of paddy in the mandis of Haryana has crossed the 23.43 lakh metric tonnes mark . Over 1.17 lakh metric tonnes of paddy arrived in the mandis of the state on Saturday. After hours of drama that witnessed a lot of resentment and slogan-shouting by INLD workers against the functioning of the SDM, Pankaj Kumar, the Ellenabad municipal chief, Raghubir Singh Jangra, got a reprieve, at least temporarily. In a gruesome incident, a man of Kherla village in the district allegedly sacrificed his 5-year-old son in hope of getting wealth. After killing the child, the father even went to a police station and lodged a report of murder. Noted educationist and the founder of New Yashoda Public School, Yashoda Mathur, died here yesterday. She was 86. The authorities have decided to shift a protection home set up for runaway couples in the working women hostel at the Old Court Road to the youth hostel located at the Shaheed Bhagat Singh Stadium on the Barnala Road here. The Haryana State Pollution Control Board (HSPCB) has caught three farmers, while they were burning paddy straw on the agriculture fields. Senior HJC (BL) leader and former MP Dharampal Singh Malik has refuted allegations by Ajay Singh Chautala that Kuldeep Bishnoi and Chief Minister Bhupinder Singh Hooda had reached an understanding during the recent byelection to the Hisar Lok Sabha seat to divert the Congress vote bank to Bishnoi. The police today booked an assistant manager of the HDFC Bank and his parents for the murder of his wife for dowry. HJC supremo Kuldeep Bishnoi today submitted his resignation as MLA from the Adampur Assembly constituency to Kuldeep Sharma, Speaker of the Haryana Vidhan Sabha, at Larsoli PWD rest house today. With the agriculture authorities expecting a yield of 24 quintal per hectare, the total crop in the district must be about 48 lakh quintals. However, surprisingly, merely 1.95 lakh quintals of cotton has reached various grain markets of Sirsa so far, though the opportune time for sowing of the next crop of wheat is fast approaching. “It is primarily due to the late start of ginning season and relatively low prices of cotton in the market,” reasoned Sushil Mittal, president of the Haryana Cotton Ginning Industries Association. 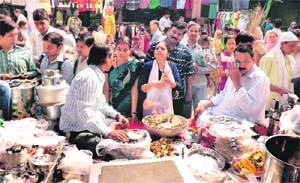 A month-long strike against high market fee by the Haryana Ginners, which ended on September 27 after an assurance by Chief Minister Bhupinder Singh Hooda, led to a delay in the arrival of cotton in the market. Untimely rains also contributed to the delay in the start of arrival of cotton. The price of cotton hovered near Rs 4,400 per quintal today, which is much higher than the minimum support price (MSP) of Rs 3,000, but much lesser than what the farmers got last year. “Last year, the price of cotton crossed Rs 7,000 per quintal and the prices shot up when a majority of farmers had already sold their produce. This year, the farmers are wary of selling their crop for lesser prices and hence whosoever has the capacity to store his cotton has been holding his crop back,” Mittal said. The figures of the Agriculture Department never match the figures of the Marketing Board that collects the market fee and the Haryana Rural Development Fund (HRDF) on all purchases made in the grain markets. According to the figures of the Agriculture Department, last year total production of the cotton crop in the district was about 37 lakh quintals. However, figures of the Marketing Board suggest that only 19 lakh quintals of cotton came to the Sirsa mandis, which was sold for nearly Rs 800 crore, fetching a total revenue of Rs 32 crore 10 lakh 17 thousand and 696 as market fee and the HRDF to the government. Much of this difference, according to the industry sources, was due to evasion of market fee and the HRDF. Industry sources hope that the arrival of cotton is likely to pick up momentum after Diwali. A bypoll for the Ratia Assembly seat is expected very soon along with Adampur, the seat likely to be vacated by HJC supremo Kuldeep Bishnoi after his election to the Hisar parliamentary seat. The Ratia seat went to Pir Chand of the Janata Party in 1977, when he defeated Sheopal Singh of the Congress by a convincing margin. In 1982, Neki Ram of the Congress defeated Atma Singh Gill of the Lok Dal by a slander margin of 196 votes. Luck smiled on Gill in 1987, when the Lok Dal candidate defeated Pir Chand of the Congress by a huge margin of over 19,000 votes. Pir Chand contested the 1991 election on the Haryana Vikas Party ticket, and he defeated the BJP’s Ram Swaroop Rama to win this seat. Rama became Haryana Vikas Party’s candidate in 1996 and won the seat by defeating Gill of the Samata Party, an earlier incarnation of the INLD. The INLD fielded Jarnail Singh in 2000, and he became Ratia’s MLA by defeating Independent Mahabir Prasad by a huge margin of over 22,000 votes. The INLD changed its candidate in 2005 and fielded Odh, who went on to become MLA by defeating Gill’s son, Gurdeep Singh Gill, of the Congress by over 10,000 votes. Odh won this seat again in 2009 on the INLD ticket, becoming the first to win the seat for the second time in succession. The INLD MLA suffered brain hemorrhage on September 5 and died in Medanta Medicity, Gurgaon, on September 12. With a bypoll for the seat expected by February next year, ticket seekers from various political parties have already begun their efforts to strike a rapport with the electorate. While stating this here today, an official spokesman said a decision to this effect had been taken while taking a sympathetic view on the representations of various industrial associations. He said that the state government had considered the problems being faced by the industrial units which had come up within the controlled areas over the years, without taking permission under the Punjab Scheduled Roads and Controlled Areas Restriction of Unregulated Development Act, 1963 from the competent authority. In view of the opinion that removal of these unauthorised constructed industrial buildings will not only affect the livelihood of the owners and its workers adversely, but will also have a serious negative impact on the industrial growth of the state, the government has decided to provide an opportunity to these industrial units to seek regularisation in accordance with the procedure hosted on the website- www.tcpharyana.gov.in<http://www.tcpharyana.gov.in/> of the Town and Country Planning Department. He said that those desirous of applying for the same could see a copy of the instructions in the office of the Senior Town Planner or District Town Planner. The government has constituted a committee under the chairmanship of the STP concerned of the circle with the DTP (Enforcement) as its member for expediting the approval and regularisation process. According to police sources, the girl, identified as Maya, a resident of Betul district of Madhya Pradesh, was found to be loitering at the local railway junction on Saturday night under suspicious circumstances. She told the police that her uncle sold her for marriage to a youth a few days ago against a payment of Rs 90,000. She said she became a widow after her husband died three months ago. The investigations revealed that the girl was married to a truck driver, Ved Prakash, a resident of Dhangar village, on October 20, but she fled from his house on October 22 and reached Jind. She told the police that as she was married against her wishes, she fled and wanted to return to her house in her native village. While no complaint has been lodged by anyone in this connection, the girl was produced before the duty magistrate, who sent her to the Nari Niketan at Karnal till she was sent back home. This is the second such incident in which a woman, hailing from outside the state, has been recovered after being sold for marriage in the region. The total samples lifted by the officials in the state have reached 24 in the past one week. The hookah bars or the lounges have been offering entertainment and indoor games facilities, including the traditional system of hookah smoking, and have been found to be charging up to Rs 200 per hour from each member. A team of officials led by the Senior Drug Inspector raided five places in the city this morning and found that two of these had been offering hookah smoking containing nicotine powder. No such drug was, however, found from the other three. The bars have been found to be offering snacks and indoor games, said an official. The places where raids have already been carried out in the past few days include Panchkula, Gurgaon, Bahadurgarh (Jhajjar), Panipat, Hisar and Bhiwani. The nicotine powder that was being used at a majority of the places has been a kind of drug and anyone who had been offering such a service on a commercial basis ought to get a licence. Haryana Food and Supplies Minister Mahender Partap Singh said of the total arrival, over 21.52 lakh metric tonnes of paddy had been purchased by the six procuring agencies and the rest by millers. Over 7.86 lakh metric tonnes of paddy had been purchased by the Food and Supplies Department, over 7.61 lakh metric tonnes by HAFED, over 2.84 lakh metric tonnes by the Agro Industries Corporation , 1.74 lakh metric tonnes by CONFED , over 1.47 lakh metric tonnes by the Haryana Warehousing Corporation and 56 metric tonnes by the FCI. The minister said the procuring agencies had also purchased 9,954 metric tonnes of bajra out of the total arrival of 21,256 metric tonnes in the mandis. The balance 11,302 metric tonnes of bajra had been purchased by dealers. Twelve out of the 17 councillors of the municipal committee had given affidavits to the Deputy Commissioner, Yudhbir Singh Khyalia, on September 26, expressing lack of confidence in the INLD- supported Jangra. However, none of them appeared at the meeting, organised in the local municipal committee, for seeking votes of councillors on the no-confidence motion today. 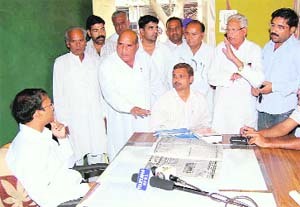 Though 11 councillors opposed to their chief were present at a separate venue with the Sirsa MP, Ashok Tanwar, who also enjoys the right to vote by virtue of his office, they preferred to stay away from the meeting as Kanta Dhanuka, one of the councillors, who gave affidavits against Jangra did not turn up at the Congress’ meeting. With their strength not enough to unseat Jangra, Tanwar and the councillors, supporting the Congress, failed to turn up at the meeting called for their votes. The SDM, Pankaj Kumar, who presided over the proceedings, announced the adjournment of the meeting till November 9. The announcement sparked protests from the INLD workers, who argued with the SDM and raised slogans against him and the Haryana Government, demanding that the no-confidence motion should be deemed to have fallen. The INLD workers led by former MLA Bhagi Ram, INLD’s local president Abhey Singh Khod, former president Mohan Lal Jhorar and the party’s city unit chief Vinod Beniwal blocked vehicular traffic near the municipal committee. Angry INLD workers met the SDM with an advocate, who produced the copy of a judgment of the Punjab and Haryana High Court in the case Babu Lal Agarwal verses Commissioner and Secretary, Urban Local Bodies Department, Haryana. Seemingly satisfied with the judgment, the SDM announced the fall of the no-confidence motion against Jangra, leading to jubilations in the INLD camp. The SDM was not available for comments, but the Deputy Commissioner said that he would issue a new date for the no- confidence motion. Karambir was arrested and produced in a local court today, which remanded him in judicial custody for 14 days. According to police sources, Karambir has also confessed to having murdered his son. The incident took place on September 28. Karambir, a jobless and drunkard youth, somehow got the idea that he could get rich overnight if he sacrificed his son Nawal before a goddess he worshipped. After having strangling the boy to death, Karambir informed the police that somebody had killed his son while he and his wife were away to attend some function in the village. He even told the police that the killer had also tried to strangle his mother, Murti Devi (65), who was sleeping alongside the child. “However, my mother got up and raised the alarm, following which the assailant fled the scene,” he stated in his statement before the police. The police registered a case and started investigating the matter, but the investigators remained clueless in the beginning. In due course of investigations, the police team grew suspicious about the conduct of Karambir. On being interrogated by the police, Karambir confessed to having killed his son. He told the investigators that he decided to go in for the sacrifice as he had three more children. She was born in Hisar in 1925. She had her schooling here after which she went to Lahore for higher studies. After completing her BT Course, she was appointed as a trainee teacher in a girls’ college in Lahore. 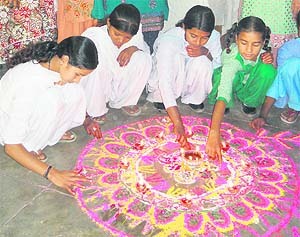 She returned to Hisar in 1946 and began teaching here in a school she established with only four students. She founded two schools here which are among the oldest and most popular schools in the city. She had a paralytic stroke a few days ago and was admitted to hospital with breathing problems. She passed away in the early hours of the morning. The protection home was set up on the directions of the Punjab and Haryana High Court and so far 29 couples had utilised the facilities. Sources said setting up the protection home in the working women hostel had not been liked by those living in it. Even parents of some girls residing in this hostel had complained. The authorities were on the lookout for a suitable place to shift the protection home and finally they have zeroed in on the youth hostel. Confirming the plan to shift the protection home to the youth hostel, the DC Yudhbir Singh Khyalia denied there was any complaint from residents of the working women hostel. “The continuation of the protection home in the working women hostel did not fit in our scheme of things, as the authorities have to provide accommodation in this hostel to women coming for training and other projects,” he said. Admitting that there had been a rise in such incidents, the SSP said the ongoing season seemed to be an opportune time for such an activity. He said it had been found that cattle smugglers did not desist from speeding their vehicles and had no respect for human lives while fleeing. He said cops could use their arms in self-defence if they were attacked or assaulted by the cattle mafia during a chase. Many cases of theft and illegal transportation of cows had taken place in the past fortnight and the criminals had been able to either flee or had attacked cops or local people after they were intercepted. The cattle mafia had a strong base in Mewat district. The action comes in the wake of a news-item “Ban on burning paddy stubble goes up in smoke” published in The Tribune on October 20. DB Batra, Regional Officer of the HSPCB at Hisar, said he sent a team comprising Nitin Mehta and Sanjeev Budhiraja, both Assistant Environment Engineers in his office, to Fatehabad after publication of the news. The team found three farmers, one in the Fatehabad area and two at nearby Barseen village, burning paddy stubble on the fields after the harvesting of their crop. He said the team had taken video pictures of the burning fields showing the farmers, who set their fields on fire. In a statement issued here, Malik said the Chautala clan was making irresponsible statements after Ajay’s humiliating defeat in the byelection. He said on the contrary there was an understanding between Chautala and Hooda. Accused Varun Tripathi, working in the Ratia branch of the bank, had brought his wife Veena (25) to the General Hospital, where the doctors pronounced her brought dead. The woman was pregnant and had a twin foetus in her womb. In a complaint to the police, the woman’s uncle, Inderesh, alleged that Varun and his parents used to harass her for dowry. A case under Sections 304-B and 34 of the IPC has been registered.